High yield bonds are tempting but come with greater chances something could go wrong. This wire gives some tips in getting the balance right between high yield and investment grade, and displays a sample portfolio for both strategies. The global bond market is a bit like an amazing buffet, so many bonds to choose from, which can make it difficult to work out how to invest. One way is to consider the risk you are prepared to take. Then determine your split between investment grade bonds: low risk, think ASX top 40 companies, with a very low chance of anything going wrong; and sub-investment grade or high yield, being higher risk, with more chance that something could go awry. With returns very low by historical standards, it’s easy to be tempted by the 5 to 10 percent per annum returns on offer from high yield bonds. It’s important to understand the additional risks and the reasons you are being paid so handsomely. Very broadly, I’d suggest most investors target a 70 per cent allocation to investment grade and 30 per cent high yield bonds. But, some will have much higher allocations to high yield, happy with the equations, substituting the bonds for equities in their portfolios. Investors in the higher quality investment grade bonds – rated AAA down to BBB- on the S&P rating scale – can expect the bonds to perform consistently; that is, pay interest every three or six months and repay face value at maturity. They make great defensive assets. This is how bonds earn the ‘sleep at night’ description. Allocating a significant portion of your portfolio to investment grade lets you employ a set and forget or hold to maturity strategy with confidence. Standard and Poor’s, assesses the probability of default across global investment grade bonds over a five year period as 0.96 per cent. Australia’s record is even lower. Default doesn’t mean loss, just that a payment has been missed. It may mean payment at a later date or eventual wind-up. The downside is that current rates of return are relatively low for investment grade bonds. Two bonds just rated investment grade, Qantas and Lend Lease with relatively short terms of less than three years, due to mature in April 2020 and May 2020 respectively, have yields of 2.88 per cent per annum and 3.17 per cent per annum. These household names are low risk with returns to match but aren’t the best rates on offer in the investment grade space. There are investment grade securities with returns around 4.5 per cent per annum, but are less well known, with one very out of favour outlier showing 6.5 per cent per annum. How much risk comes with a higher return? Sub-investment grade or high yield bonds – rated BB+ down to D step up in risk and also return. Most will also perform to expectations, but there may be unexpected events that cause prices to fall, adding volatility. Careful analysis can reap rewards but the chance of something going wrong increases significantly. Standard and Poor’s assesses the probability of default across all global sub-investment grade bonds over a five year period as 15.29 per cent – 15 times more than investment grade counterparts. To take on that extra risk, investors need to do their homework and play close attention to the drivers of the company, profitability, cashflow and balance sheet, the debt levels and when debt or bonds become due for repayment. How the bond fits into the group structure and where it sits in the debt maturity profile are factors. Other risks that need to be assessed include: regulation, competition, new competitors, disruptive technology, commodity prices and management, just to name a few. Over the years we’ve presented a range of sample portfolios to give ideas to new and existing clients of the types of bonds available. The investment grade has a minimum rating of BBB- (or equivalent). Whereas the high yield includes ratings below that. As a reminder, credit ratings can only be disclosed to wholesale investors. The portfolios were developed by our Portfolio Strategy and Research teams to show example portfolios and the associated yields they offer. Portfolio Strategy has a current recommendation that investors allocate roughly equal percentages to the three different types of bonds – fixed, floating and inflation-linked and both portfolios reflect that current view. Below is the investment grade portfolio which has a high allocation to senior secured bonds. The Portfolio Strategy team deliberately chose these bonds to help protect capital and income. Legally, if the company goes into a wind-up or liquidation, any funds available for debt and equity will be repaid to senior investors first. The investment grade portfolio only contains Australian dollar denominated bonds and has a high allocation to bonds linked to infrastructure. Although we practise sector diversification, we are typically comfortable with larger allocations to this sector as it is usually stable and exhibits low volatility. Sydney Airport is a commonly used security, as is Sungroup, which is the finance subsidiary of a Transurban led consortium managing a network of Queensland toll roads. 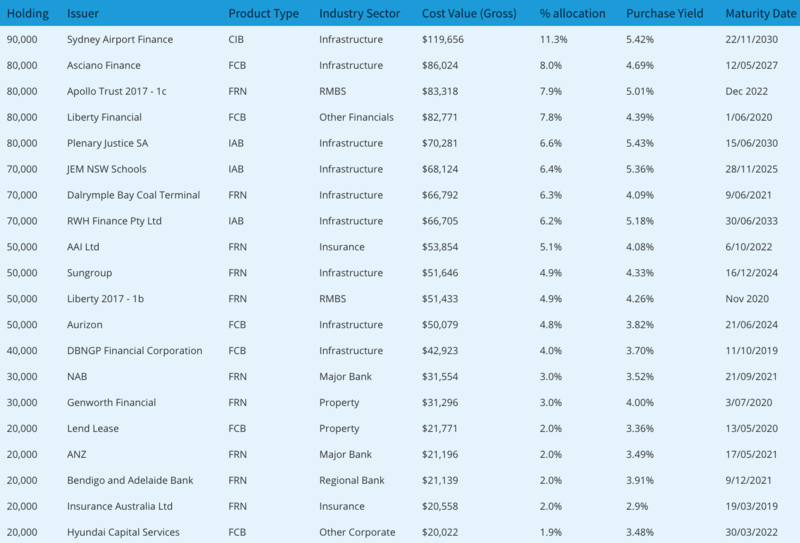 The high yield sample portfolio has an allocation to sub-investment grade Australian companies like Axsesstoday and Lucas Total Contract Solutions as well as a holding in the US high yield market, including names like Hertz, Avon, Frontier and Newcastle Coal. 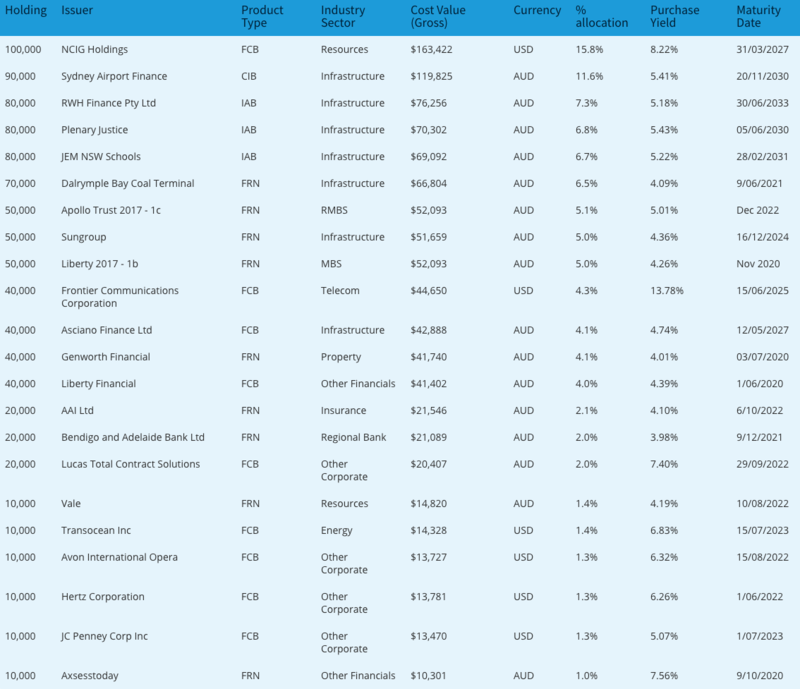 Naturally, this portfolio also has core holdings in Australian investment grade names as well. How does New Zealander access these options? Hi Geoffrey, unfortunately we can only offer these bonds to 'Australian residents for taxation purposes'. You'll need to find a bond dealer/ broker in New Zealand in order to set up an account and trade.